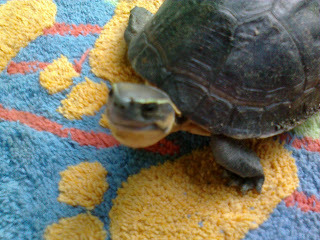 We have a pet turtle named Pong. (or pong-pong as my aunt calls him) He's been here for 6months or so... I don't know what kind of turtle he is, so just take a look. I read that turtles need to eat at least 3 healthy foods a day. But Pong is so picky! He eats bananas before. Then, time came that he doesn't want it anymore. We tried feeding him leafy vegetables, to no avail. What he eats now is Gardenia's White Bread! SERIOUSLY. I found some FUN FACTS about turtles here. While most turtles don't tolerate the cold well, the Blanding's turtle has been observed swimming under the ice in the Great Lakes region. The top domed part of a turtle's shell is called the carapace and the bottom underlying part is called the plastron. Most land tortoises have high domed carapaces that offer protection from the snapping jaws of terrestrial predators. 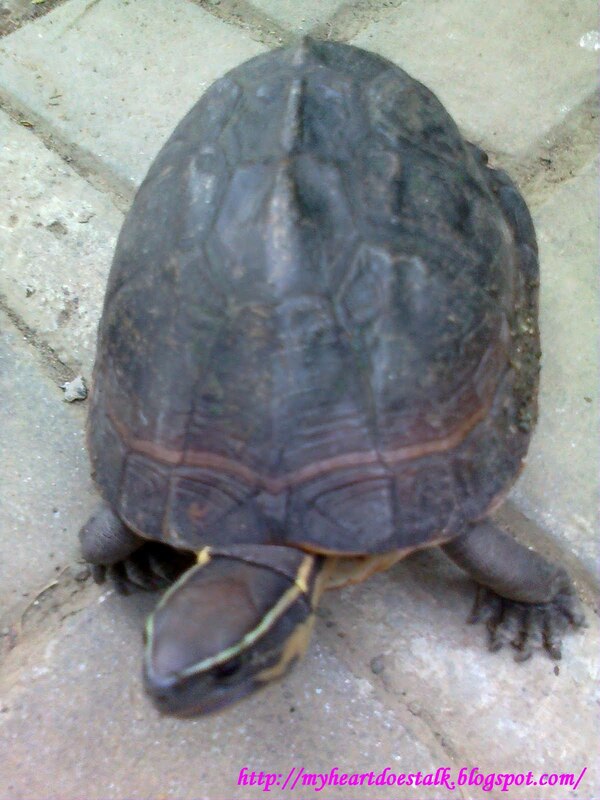 Aquatic turtles tend to have flatter more aerodynamically shaped shells. An exception to the dome-shaped tortoise shell is the pancake tortoise of East Africa that will wedge itself between narrow rocks when threatened and then inflates itself with air making extraction nearly impossible. Most turtle species have five toes on each limb with a few exceptions including the American Box Turtle of the carolina species that only has four toes and in some cases only three. omg.. i can't imagine petting a reptile! hehehe. doesn't your turtle smell scaly, you know, that reptile smell snakes or big lizards got.. hehehe.. kiddin'..
oh! 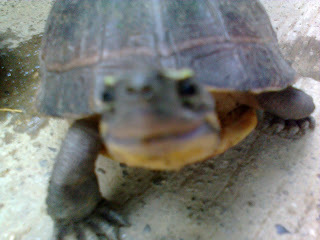 I want to have turtles too.. I tagged you lily, check my latest post! thanks for taking time to read people!